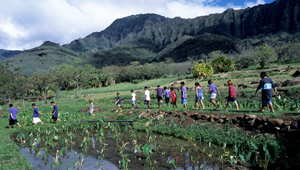 Deep in Wai`anae Valley on the leeward coast of O`ahu and in the shadow of Mauna Ka`ala--the oldest and tallest mountain on the island--lies the Cultural Learning Center at Ka`ala Farm. For over twenty years, this nonprofit Native Hawaiian organization has focused on restoring ancient, abandoned lo`i kalo (taro paddies) to their traditional role as the breadbasket of the Wai`anae coast. The center works with youth from the economically depressed area, reconnecting them to their culture and the land. Ka`ala Farm itself is leased from the state, but the only access to it is along a narrow roadway that crosses private land. In December 2003, TPL helped Ka`ala Farm acquire this critical piece of property, ensuring permanent access and providing a land base for the farm's future growth.